Hi Jennifer, glad I found you. Unfortunately I have nothing to share at the moment, but I will be happy to join your future link parties. So nice that you organize these cool events. All the best! I'm a little sad that this is the last link party Jennifer :( This one cropped up on me unexpectedly! I hope to link up a little later than usual. Love the colours of your two projects. I'm getting a little bit of stash build-up these days too. Making the remnants into a big project is appealing ... something from nothing, right? Hope you're feeling better soon. I'm under the weather today too, which is rare for me. A little knitting seems perfect for today. Really like the colors in the throw, that raspberry is gorgeous. Such pretty blankets Jennifer. Your granny blanket is beautiful and I really like the ripple blanket too. I'm sorry you're still not feeling well and pray that you'll soon be over this nasty bug. 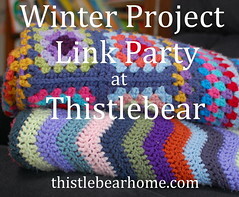 I have enjoyed following your winter link party, seeing what everyone is making and watching progress. I love your sunburst granny squares as they look so cheerful and look forward to seeing them grow in the future. Such lovely colours and beautiful photos!! The color palette of that ripple throw is beautiful.. Thanks for hosting another party, Jennifer. I've so enjoyed joining in with them this winter, and am looking forward to seeing what everyone has been busy creating this time. Your blankets both look beautiful! I should have asked at the time but is there a summer or all year 'project link up' that you know of at all please? Just sad I missed it. I've been looking at 'Five at Five' but not sure I'd have five things to show lol.